Take a journey through one of Africa's least explored countries - a true blend of natural wonders and ancient history. The medieval town of Harar kicks-off a fortnight of exploring rock-hewn churches, rugged mountains and thundering waterfalls. Harar - A medieval walled city and the cradle of Islam in Ethiopia. Sitting at an altitude of 2438 metres, Addis Ababa is a modern African city which is far more developed than you might imagine. Barely more than a century old it is home to some elegant buildings set along wide streets, dispersed with plenty of green space. Our trip starts here in the morning. We have a few hours to acclimatise and freshen up in day rooms before returning to the airport for our afternoon flight to Dire Dawa . Upon arrival there is a real sense we have arrived in Africa, as monkeys hang in the trees and vultures fly overhead. It is an hour's drive on to Harar, our home for the next two nights. Nestled into a hillside, Harar is a rarely visited walled city which is pierced by five gates and topped by 25 towers. Harar is the cradle of Islam in Ethiopia and by the Middle Ages had become known as the fourth most sacred city in the Islamic world. It remained closed to outsiders for centuries. Our hotel is located within a short distance from the city walls and we spend today exploring the markets on foot and walking within this great maze of colour, noise and smells. It is a true assault on the senses as we share the narrow alleyways with market traders, goats and donkeys. The locals are incredibly friendly and children walk alongside us practising their English and giggling amongst each other. We return back to our hotel for lunch before venturing out again in the afternoon, this time our bus will drive us a little way outside of the town so we can appreciate the views of this walled city from a distance. We also visit a beautiful traditional Harari House and learn about life here from our local guide. Today is one of our longer days of driving (approx. 6 hours) as we depart Harar and head towards Awash National Park which is situated in the savanna of the Rift Valley. The journeys in Ethiopia are a real highlight, the scenery and road conditions may be very different from what you imagine. The roads are predominantly smooth tarmac whilst the landscape is lush and green. Today we drive through rolling countryside dotted with small villages; we may pass by caravans of camels and children walking to school. Our first stop is in the town of Aweday which is home to the country's largest chat market (a mildly stimulating plant). Our visit is met with enthusiasm and interest from the locals as they are unused to seeing tourists here. We arrive at Awash National Park around mid- afternoon. The skyline of the park is dominated by the jagged edges of Mount Fantelle - a dormant volcano whose crater towers above the surrounding bush. We start our exploration at the Awash Falls, located near the park entrance, where crocodiles are often seen lazing by the water's edge. We will then take a game drive through the park; the most visible large mammals are the Beisa oryx, Soemmering's gazelle, warthogs and the Slat's dik-dik whilst the birdlife is also impressive. We return back to our hotel after sunset. This morning is spent driving back to Addis. Travelling through the Great Rift Valley we make a stop at Lake Baseka and also an extinct volcanic crater before arriving back into the capital. We aim to arrive around lunch time before taking a tour of the main highlights of the city. This includes the Church of the Holy Trinity, whose large dome and slender pinnacles make it a landmark in the city, and the Ethnographic Museum which is located in the attractive grounds of Addis University. We end our tour with a visit to the National Museum which houses 'Lucy'. The partial remains of one of human kind's earliest ancestor discovered in Ethiopia in 1974 and believed to be 3.2 million years old. Tonight is free to experience one of the many restaurants in the city. We have a very early start this morning as we take a flight north to Bahir Dar, capital of the Amhara region and situated on the shores of Lake Tana. After checking into our hotel we take around a one hour cruise across the lake to the Zeghie Peninsula. Here we disembark and have a 15 minute walk along a rough pathway up to Bete Maryam Monastery also known as the House of Mary. This impressive building dates back to medieval times and contains valuable murals and religious treasures. After our visit we make our way back across the lake arriving at our hotel around mid-afternoon, and have the rest of the day free to enjoy the surroundings. Our hotel is positioned right on the shore line and provides a wonderful setting for a sundowner. We can also walk around the lake and into town from here, visiting the local market or relaxing in one of the coffee houses where we hope to see a traditional coffee ceremony. This morning you may choose to take an optional boat trip across the lake. Here we focus on the wildlife, as hippos, fish eagles, pelicans and other birdlife are often spotted at this early hour. After breakfast we drive a short distance south of Bahir Dar towards Tississat Falls, also known as Blue Nile Falls. We cross the Nile by a local boat before taking a 30 minute walk to the hill top viewpoint. From here, you can understand the Amharic translation for these falls - 'the Water that Smokes'. Unfortunately, the construction of a nearby hydroelectric plant dramatically reduces their volume on occasions, but they are still an impressive sight to behold. There may be the opportunity to extend our exploration to a further one hour circular walk which passes through small villages. After lunch we drive to where the river meanders towards the falls. Here it becomes the Blue Nile on its thousand-mile journey to meet the White Nile at Khartoum. Hippos can often be spotted from this viewpoint. Tonight is a free evening, you may like to sample the fresh fish in one of the local restaurants. Leaving Bahir Dar we drive across the Nile as we make our way towards Gondar, located on the high plateau just north of Lake Tana. We break the journey with a coffee stop in the town of Woreta, a bustling place where we enjoy the ambience of the locals walking to market. Gondar's most famous monuments are its exceptionally well preserved 17th century castles. The largest and best is that of King Fasilidas. It is a stone-built construction with round turrets and wooden balconies. The king also built remarkable baths a mile or so outside of town known as the 'Pavilion of Delight'. This whole complex of buildings is unique in Ethiopia and unlike anything found elsewhere in Africa. 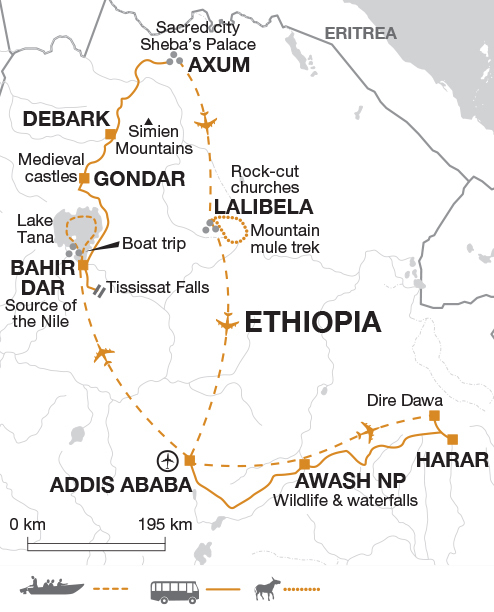 We should arrive at Gondar in time for a quick lunch before spending the afternoon exploring these impressive sites as well as visiting the baths and the castle ruins. We also make a stop at Debre Berhan Selassie Church, famed for its ceiling frescoes of many faces. We can enjoy a relaxed morning and possibly a swim at our hotel in Gondar before getting back on the road and setting off for Debark. This is about a four hour journey, and the scenery becomes increasingly spectacular as we head towards the Simien Mountains. Many of the peaks here rise above 4000m, the highest is Mount Ras Dashen which at 4543m and is the fifth highest in Africa. Debark is a small town and is the gateway to the Simien Mountains. The facilities here are very basic but the locals are friendly and welcoming. We have dinner in our hotel and if lucky may be treated to some local music and dancing. Today we explore the Simien Mountains National Park on foot. It is a rough road from our hotel up into the mountains but the scenery more than makes up for it. With very few people venturing here we often have the mountains all to ourselves. Walking along well- worn tracks we keep a look out for the endemic gelada monkeys. They often appear as if from nowhere, in huge numbers, and are very relaxed in our company. We may sit with them for some time, just watching as the older ones groom each other whilst the youngsters play in the trees. We return to the bus for our packed lunch before taking a more challenging walk this afternoon. This takes us higher into the mountains and the views are spectacular. We follow established tracks and incorporate numerous stops for rest and photos. If you prefer there is the option to remain on the bus should you not want to take the longer walk. Today is another long but incredible journey as we drive to Axum. The route takes us high over the Simien Mountains and down through the Tekeze Valley where giant baobab trees loom. This road has recently been completed and apart from the first 40km it is smooth asphalt the whole way. We enjoy plenty of photo stops and take a short walk through a village saying hello to the friendly locals. The sacred city of Axum sits in the Tigrayan region and was the capital of the Ethiopian empire between the 1st and 10th centuries AD. As the birthplace of Christianity within the country, it was also a bustling commercial centre. We arrive in time for dinner and enjoy a two night stay here. We have a full day exploring Axum by bus and on foot with our local guide. Evidence of its former importance now lies in several places in or near the town. Ruined fortresses, palaces and churches, plus an abundance of giant obelisks, or 'stelae', stand as mute reminders of its former glory. We clamber down numerous steps into dark tombs, one of which is believed to be that of King Balthazar, one of the Three Wise Men; whilst we also visit Axum Cathedral, the chandelier here a gift from Queen Elizabeth in the 1960's. Axum claims to be the final resting place of the sacred Ark of the Covenant, but while its local guardians continue to celebrate the legend, the object of their veneration is kept strictly under wraps. There may be some free time at the end of the day to take a stroll through the town visiting the large market square and browsing the shops. Today we fly to Lalibela, a UNESCO World Heritage Site and one of the world's most remarkable historic sites. Deemed 'The New Jerusalem' it is believed to have been constructed some 800 years ago by King Lalibela as his capital city. Lalibela is home to 11 medieval rock cut churches and although churches carved in rock are found in other parts of the world, the ones here are particularly significant. Excavated on all sides of a rectangle, a large block of granite was left, isolated in the centre. This rock was then shaped and formed both inside and out and the carvings show extremely skilful workmanship. This afternoon's tour around the churches involves a certain amount of scrambling along uneven paths and through a labyrinth of tunnels. The churches stand in two main groups on either side of a stream, known locally as 'The River Jordan'. The most impressive and well known of these is 'Bet Giorgis'. Carved in the form of a Greek cross it is approached through a passage in the rock. Between them, these rock-cut churches are one of the great wonders of the world. We spend the afternoon visiting a handful of the churches and will return to see the rest tomorrow. This morning we meet our mules and muleteers for an adventurous ride up the mountainside to Ashatam Maryam Church. The going is steep in places and we need to hang on, but its great fun and the views across Lalibela and beyond are incredible. We ride for around an hour before dismounting and making the rest of our way on foot. The church is reached along steep shale pathways and good footwear is a must. There is the option to forego your mule for the bus and join the rest of the group at the start of the walk if you prefer. Vertigo sufferers or people with a low level of fitness may choose not to partake in this activity, your tour leader can advise you. Our return ride back down into town takes us through a small village where we may enjoy coffee with a local family. This afternoon we return to Lalibela, allowing more time to explore the rock-cut churches. This morning we take a flight back to Addis Ababa, where the tour ends. Ethiopia is generally pleasant and warm, but varies with altitude. The long rains usually arrive mid- June to early September and the short rains between mid-February and April although this pattern has been completely erratic in recent times. After the rains, the highlands of northern Ethiopia are usually green and thus particularly scenic. The temperature all year round rarely falls below 18°C. Night-time temperatures in the mountains can be cold and can drop below freezing at higher altitude. There is a strong risk of sunburn at high altitude in Ethiopia. Additional information and climate charts can be accessed at http://www.explore.co.uk/weather. Seasonal weather patterns can be unpredictable. Up-to-date information on the weather worldwide can be found by following the BBC weather link on this page. Daytime temperatures are mainly warm and comfortable but evenings in the highlands can be cold. We recommend a thick jumper or warm fleece and lightweight wind/waterproof clothing. Take a sun hat. Comfortable, good walking shoes with ankle support are strongly recommended as well as comfortable sandals. Bring sun cream, a torch and memory cards for your camera. An insect repellent against fleas could be useful for the churches at Lalibela. Although entirely voluntary, tipping is a recognized part of life in this region of the world. Some local staff will look to members of the group for personal recognition of particular services provided. In order to make things easier for you, your leader may organise a group's tips kitty afor included activities and meals and if this is the case, they will account for it throughout the tour. Accordingly, you should allow US$50.00 per person for tipping of local drivers, guides, boat crew and for any miscellaneous tipping of hotel staff. It is advisable to take your spending money in Sterling, Euros or US Dollars cash (high denomination notes usually get better exchange rates). Please note that any pre- 1999 or torn US Dollar bills will not be accepted in Ethiopia. Please keep any receipts as you may be able to change back any unused local currency. Very difficult to exchange and are not recommended. Ethiopia: Visas for UK nationals can be obtained on arrival, although this can change at short notice, and you should be prepared to queue on arrival. Please ensure you have 2 recent passport sized photos with you when applying on arrival, these may or may not be asked for. For a single entry visa you can apply via the e-visa website: https://www.evisa.gov.et/#/home. You will need to print a copy of your evisa approval letter and present this with your passport at immigration upon your arrival. The approval letter will take a minimum of 3 days to be processed so we strongly advise for you to apply within plenty of time before your departure. You will be permitted to stay within Ethiopia for upto 30 days or upto 90 days depending on which single entry visa you request. We strongly recommend for you to read the Help section on the e-visa website before applying. Should you wish to apply for a visa prior to departure via the consulate in the UK, please note that a single entry visa is valid for 30 days from the date of issue, so you must submit your application no more than two weeks prior to departure. It is also possible to apply for a multi-entry visa which is valid for 3 months from issue. We recommend protection against malaria, hepatitis A, diphtheria, tetanus, typhoid and polio. Although the risk is low you may also consider immunisation against rabies and meningococcal meningitis. Consult your travel clinic for latest advice on different prophylaxis available against Malaria. Please check the latest requirements with your travel clinic or doctor prior to departure. The above is not an exhaustive list. Further information regarding vaccinations and travel health advice can be found by following the NHS and NaTHNaC links at Explore Travel Health and from your local healthcare provider. Visa and vaccination requirements are subject to change and should be confirmed by you before travelling. This tour is for travellers who want to get to grips with Ethiopia and really understand the culture of this fascinating country. Many other operators just visit the highlights in Ethiopia, but on this tour you will also explore Harar and Awash National Park, a great opportunity to get off the beaten track and witness untamed Ethiopia.